New Rochelle, NY, March 22, 2018–The effectiveness of acupuncture compared to standard treatments has led to its growing inclusion in pain guidelines and in delivery organizations like the U.S. military and Veterans Administration, yet many continue to believe acupuncture lacks scientific credibility. Central to the skepticism are unanswered questions about acupuncture points. 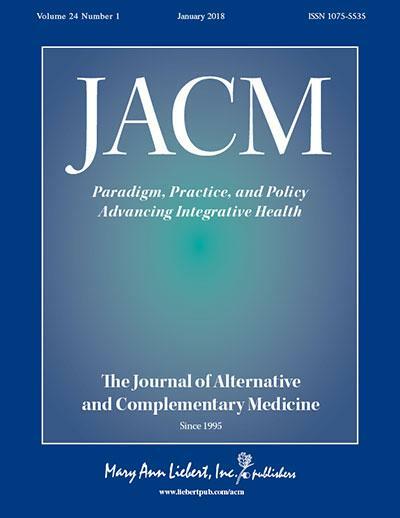 Integrative health researchers from Harvard Medical School propose a coordinated effort to develop a clear definition of acupuncture points and to carefully evaluate their "specificity" and possible biological basis, as described in The Journal of Alternative and Complementary Medicine (JACM) a peer-reviewed publication from Mary Ann Liebert, Inc., publishers dedicated to paradigm, practice, and policy advancing integrative health. The article is available free on the JACM website. Helene Langevin, MD and Peter Wayne, PhD, Brigham and Women's Hospital, Harvard Medical School, Boston, MA, face head-on the criticism that there is a lack of scientific rigor underlying acupuncture in the article entitled "What Is the Point? The Problem with Acupuncture Research That No One Wants to Talk About." The acupuncture research community has for too long ignored the need for better terminology and for less confusing, more biological or anatomical descriptions of acupuncture points, contend the authors. Without the basic scientific and comparative studies needed to support acupuncture as an evidence-based therapy its legitimacy will continue to be questioned and its inclusion as a healthcare service will be limited. Lead author Langevin notes that "For decades, acupuncture research has served as a convenient punching bag for skeptics. Researchers need to fix some problems that contribute to this situation." "Acupuncture is making a leap into mainstream health care. This position of relative strength is a great time to take on sticky challenges that remain in its evidence profile," says JACM Editor-in-Chief John Weeks, johnweeks-integrator.com, Seattle, WA. "Langevin and Wayne thoroughly examine the issues and propose a path forward. Their paper is a landmark document for moving our understanding of acupuncture to the next level."